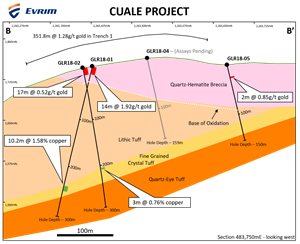 VANCOUVER, British Columbia, Dec. 06, 2018 (GLOBE NEWSWIRE) -- Evrim Resources Corp. (TSX.V:EVM) (“Evrim” or the “Company”) announces initial drill results from the Cuale high sulphidation epithermal gold project in Jalisco, Mexico. 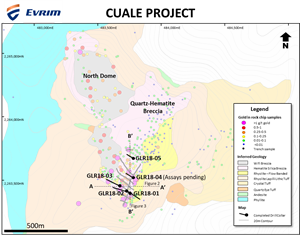 The Company has received assay results from four of the first five drill holes targeting the La Gloria prospect. A total of 1,167 metres has been completed of a planned 3,000 metre program. Regionally, the project is located within the Talpa de Allende area of Jalisco near Agnico Eagle Mines&apos; Barqueño project (645,000 ounces gold and 38 million ounces silver) and Endeavour Silver&apos;s Terronera project (436,000 ounces gold and 42 million ounces silver). The area is close to infrastructure with roads and powerlines crossing the property. 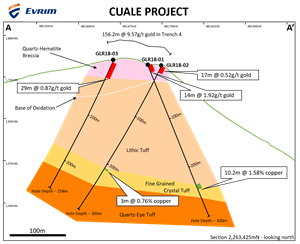 Evrim&apos;s disclosure of technical or scientific information in this press release has been reviewed and approved by Stewart Harris, P.Geo. Vice President, Technical Services for the Company. Mr. Harris serves as a Qualified Person under the definition of National Instrument 43-101. Although the Company believes the expectations expressed in such forward looking statements are based on reasonable assumptions, such statements are not guarantees of future performance and actual results may differ materially from those in the forward looking statements. Factors that could cause the actual results to differ materially from those in forward looking statements include market prices, exploitation and exploration successes, and continued availability of capital and financing, and general economic, market or business conditions. Investors are cautioned that any such statements are not guarantees of future performance and actual results or developments may differ materially from those projected in the forward looking statements. Forward looking statements are based on the beliefs, estimates and opinions of the Company’s management on the date the statements are made. Except as required by securities laws, the Company undertakes no obligation to update these forward looking statements in the event that management&apos;s beliefs, estimates or opinions, or other factors, should change.